You may be a fan of Mitsubishi’s great cars and trucks of the past, longing for the days of the Montero and Lancer wagons. But you may not realize that Mitsubishi still sells these cars, just not to Americans. Today is as good a day as any to take stock of what Mitsubishi sells to the rest of the world. Mitsu just booted Ghosn and is primed for a shakeup. Well, I’m not really here to make a business case for Mitsubishi. That’s Mitsubishi’s job. It’s my job to tell you that in 2018 you can buy a brand new Mitsubishi pickup truck if you want. That’s the Mitsubishi Triton, also called the L200. It’s a real body-on-frame pickup, a midsizer not unlike the current Ford Ranger or Chevy Colorado or Toyota Hilux if you’re keen on international vehicles. That’s no surprise, too. The Triton is developed in Thailand, where the rest of all those trucks are designed and built as well. Where the Triton stands out is that it’s probably the most basic of all of these pickups, offering the least power from a set of four-cylinders. Still! Neat. Anyone crossing the Canadian border up to ski country will probably see one or two overlander-grade Mitsubishi Delicas parked up beside the usual SUVs and wonder why we don’t get them in America. They look incomprehensibly practical, offering real off-road tech like locking diffs and low range with economical engines and super efficient design. They’re minivans with cred, basically. Those are usually all Delicas from the 1990s, though, bought up by slightly more financially stable dirtbags, versus their usual old pickups with camper shells. 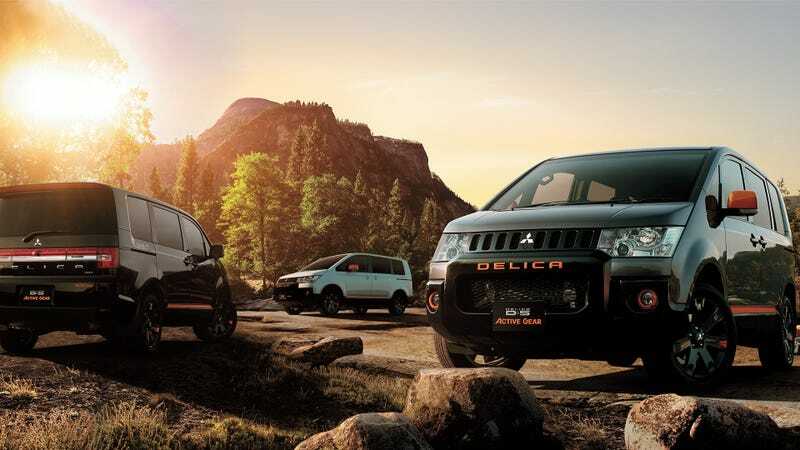 Do not forget, though, that Mitsubishi still makes the Delica, with the current generation stretching back to 2007. The new Delica D:5 isn’t quite as rugged as the older ones, and figuring out exactly what grade of all-wheel drive it has is a bit of a challenge. All I can tell after reading a bunch of Wikipedia is that it has basically what the Outlander has, or the Evo, with Mitsubishi’s All Wheel Control, with an electronically-controlled center diff. I’ll also say that it’s not quite two feet shorter than a Chrysler Pacifica and three-quarters of a foot skinnier, though it still seats eight. If I was picking the off-roadiest of the current Delica range, I’d go with the Delica D:5 Active Gear or the Delica D:5 Jasper, the latter of which gets not only big bumper guards and mud flaps, but also lots of interior gear tie-downs and organizers, perfect for when you’re bumming it in the outdoors. This is actually a freshly-debuted new Delica, hence the angry face. The Urban Gear is the luxury trim version, which you can get with those eight seats in quilted leather. It also comes with a deep body kit from factory taking up the Delica’s otherwise-decent ground clearance. It’s like a luxury SUV, only not gigantic. This is going to take a second to explain, as this car is a Suzuki ultra-small Japanese kei car, only it’s not a kei car, it’s Suzuki’s slightly larger version of its kei car that no longer meets kei size and power restrictions, only badged as a Mitsubishi. So this is the Suzuki Wagon R, only bigger so it’s a Suzuki Wagon R Wide, now known as the Suzuki Solio, here sold and badged as a Mitsubishi Delica D:2. This version is the D:2 Custom, equivalent to the Suzuki Solio Bandit. You’re looking at the lux trim here, with snappy styling and two-tone paint. It’s a box on wheels with hybrid drive, kind of like if the Scion xB never got bad. I had to look this one up twice to make sure it wasn’t a modified Honda Fit, but it is indeed an all-Mitsubishi design, a compact front-engine/front-wheel-drive mini-minivan. This guy is a hit in Southeast Asia and in South America. Earlier this year Mitsubishi had to double its production of this car to meet demand. It’s only about an inch wider than a Fit, but nearly a foot longer and half a foot taller. It makes do with a 1.5-liter four-cylinder, which Americans will be clambering for once gas prices shoot up again. This one won’t come up if you scroll through Mitsubishi’s Japanese lineup, as it’s a Chinese-market vehicle. This isn’t even a Mitsubishi design, even. It’s one of four vehicles rebadged from China’s GAC, meant to meet the Chinese government’s new strict EV requirements. Indeed, the specs on this thing are lusty for Americans: a claimed range of 410 km (255 miles) on a single charge under the Chinese test cycle, and a price tag of about $20,000 after subsidies. This is the kind of car that American car companies should have been making for years now, but somehow havent gotten their act together enough to do. Every so often I see an old Colt or Lancer station wagon parked on the street. What I didn’t realize is that Mitsubishi still sells a compact wagon, called the Lancer Cargo. It looked oddly familiar. That’s because this is a rebadged Nissan, currently called the NV150, but probably better known as the AD Van or the Wingroad. It’s closely related to the not-particularly-loved Nissan Note we get here in the States, only in proper longroof style. The current Paj fits into the same sort of niche as the Toyota Land Cruiser and the Nissan Patrol, the latter sold here as the Armada. And if you’re curious, the Paj is priced closer to the Armada than the Land Cruiser, coming in at about the high end of what an Outlander costs, going off Australia pricing. So here in America it feels like it’s only a matter of time before gas prices shoot up again and people are looking for smaller, simpler, versions of the crossovers and trucks they’re addicted to at the moment. Mitsubishi has tons of these vehicles developed and in production. Would it be wise for the company to bring them all over here? That’s a question that I hope Mitsubishi is asking itself right now.